MBM Mentor Studied How Long Distance Running Affects Women’s Lives: Introducing Alison Boudreau, Ph.D. Sometimes life’s most challenging events are the ones that help to initiate meaningful change in one’s life. This was the case for Dr. Alison Boudreau, a new mentor guiding students in the College of Mind-Body Medicine at Saybrook University. Alison experienced a convergence of profound life events all around the same time — the loss of a friend and the loss of her job in the aftermath of the 9-11 terrorism event. These experiences had a transformative effect on her and changed her life’s path. When Alison’s friend Louie Bonpua learned he had Leukemia, he gathered 100 friends to train for 10-months to complete the Canadian Ironman Triathlon to celebrate his life. On August 26, 2001 everyone crossed the finish line, including Louie and including Alison. Sadly Louie passed away the following January, just a few days after carrying the Olympic Torch in San Francisco. Training for an Ironman event takes desire, perseverance, camaraderie, and commitment to the goal. It was amidst the camaraderie with Louis and his friends that Alison started to get a glimpse of how she would transform loss into her new life’s passion. Through honest and open self-reflection and self-discovery, Alison realized that she is most fulfilled when she is going to school and engaging in the process of learning with others. Soon she changed her life’s direction and enrolled in an MA program in Organizational Psychology at John K. Kennedy. After completing the MA, she enrolled in a PhD program in Organizational Systems at Saybrook University. Alison’s topic of interest for her Ph.D. dissertation was the effect of long distance trail running on stress and personal growth for women. She had an earlier personal connection with running that energized this desire. Alison was born with a slight walking disability. Her physicians told her parents that she would never run “normally.” Alison’s personal love of trail running began when she was sixteen years old, when she had a very energetic and hyper Australian Shepherd dog, named Tache. He needed regular exercise to stay calm. Alison began to take Tache to the Stanford foothills in the Bay Area to run and play with the cows. It was in the peacefulness and serenity of nature that she discovered the profound power of nature and exercise to heal. Trail running and playing with her dog became her personal therapy, and gave her a new sense of confidence. 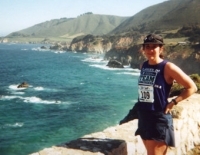 In those years Alison developed a love of running that continues today. Understanding the power of the combination of being in nature and trail running first hand prompted Alison to delve deeper into the connection between training and resilience in women for her Ph.D. dissertation. Alison chose to focus on women because she noticed that women feel a different sense of burden than their male counterparts. However, what was more profound was that in general women feel guilty when they take time to train and engage in exercise. Alison learned a great deal through her dissertation research about the power of nature and exercise to transform people lives. She is excited to apply her coaching style, emphasizing personal transformation, to students at Saybrook.